Dive Log Book, developed by DNA BLU in partnership with SCUBAPRO UWATEC, allows you to import and display dive profile data from SmartTRAK and DataTRAK files from your PC, transferring them to your iPhone. 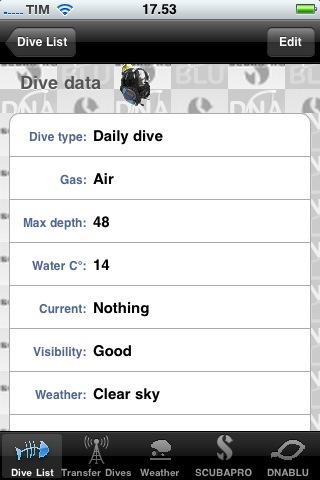 This application allows divers to transfer and carry dive data from all dives recorded using SCUBAPRO UWATEC dive computers (Aladin, Smart and Galileo series). It also lets you manually insert dives on your iPhone. The Application allows you to transfer and carry with you data and dive profiles from your dives recorded by all SCUBAPRO UWATEC dive computers (Aladin, Smart and Galileo computer series). The included photo and video gallery will help you to recognize fish, corals and nudibranchs most commonly found underwater. Both the taxonomic and common identification names are indicated. Also easily accessible, updated marine weather conditions and forecasts especially relevant for divers, including water temperatures, winds, wave heights & lengths for the entire globe. This data is courtesy of NOAA, usno.navy.mil and the “Lamma Consortium of the Regione Toscana”. A photo library is also accessible, including various fish, corals and nudibranch images, resulting in an ideal educational tool for all levels of divers. 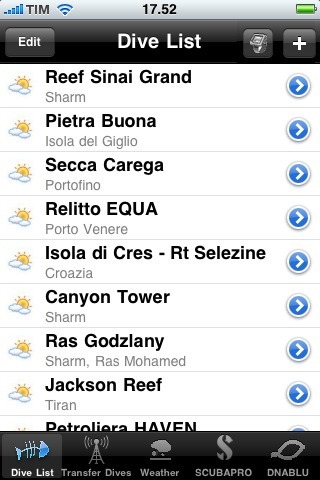 This application also makes specific dive weather conditions easily accessible, including temperatures, winds, wave heights & lengths for the entire globe. This entry was posted in Uncategorized on October 21, 2010 by pacificadive. 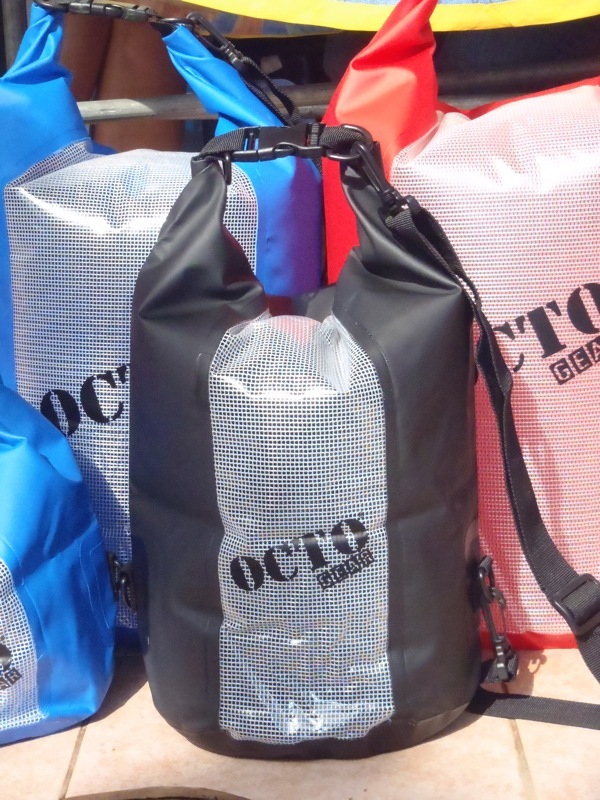 The OCTO DRY BAGS by OCTO GEAR is designed for any activity in and out of the water. Its strong and durable PVC material ensures watertight transport in any situation. The semi-clear front panel lets light in, but keeps personal items and valuables out of sight. The Octo dry bag is available in 12, 20, 30 and 40 liter volume and comes in black, red and blue color. It comes with a comfortable shoulder strap which can be clipped to any of its four D-Rings giving different carrying options. If stored unattended or used as check-in luggage, its top D-Rings provide security feature by giving provision for a padlock or cable-tie. Its 2 side D-Rings provide further fastening features to ensure safe travel on the back of a kayak, motorbike or various other situations. The Octo Dry Bag is priced from 590PHP- 890PHP depending on size. It is available at PACIFICA DIVE and many of it’s retail partners. This entry was posted in Uncategorized on October 6, 2010 by pacificadive. This entry was posted in Uncategorized on October 5, 2010 by pacificadive.